I had hoped but never quite believed that I could win the big prize. But, somehow I have. Thank you to TravelSupermarket.com for sponsoring a great contest and to the 5 judges who worked so hard to pick a winner — they had a ton of entries. Ken Kaminesky was kind enough to nominate me and judged the Blue category. Daniel of Canvas of Light was in charge of Red (and judged me worthy of a free iPad — see above), while Abi of Inside the Travel Lab took care of the Green entries. Dave and Deb of The Planet D were in charge of Yellow and Christine over at Almost Fearless judged White. I’d like to offer a HUGE thanks to all of the judges, as well as the kind folks at TravelSupermarket. When you’re traveling on a tight budget, a £2,000 travel credit is an amazing gift. Thanks so much. Congratulations! You truly deserved the big price. What are your travel plans with the refuelled wallet? Not sure. Missing Asia and really want to see Burma before Starbucks finds it so it may be the other side of the world for me soon. OMG are you ‘really’ surprised? *grin* Congrats! *Very* surprised. They had over 500 entries by the end. Nicely done! It’s one thing to come up with a single stunning entry – but all FIVE of yours are awesome! Sometimes, it really pays off despite not having an aim to win the contest. I do love your extra ordinary and well-captured shot. Congratulations for your win! I’m so glad you won! 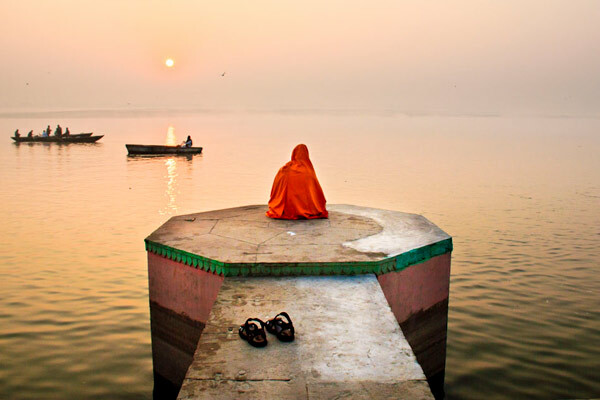 All of your entries in the contest were amazing, but ever since I first saw your winning picture of that man sitting on a dock in the Ganges, I’d always thought it was really beautiful. Philippines are definitely on the itinerary. I’m thinking of heading back to Asia this winter and catching up with friends in Thailand, then hopefully visiting Burma, the Philippines and Bali (but back to Chiang Mai in April for Songkran — greatest party on the planet). Central America is lovely but I’m ready for a change. Omg, really? Then I can’t wait to read about all the crazy situations you’ll get yourself into when you finally arrive here! Anyway, sorry if I seem a little pushy here, it’s just that you’re my favorite travel blogger (if you couldn’t already tell) and I’ve been dreaming for a long time to hear your take on the Philippines. I’m sure you’ll love it here, btw! Congratulations! I looked at dozens of websites entered into the contest and I had a feeling you might win. I love your Ganges photo and the Guatemala photo as well. Awesome, well done Wes! Thoroughly deserved with that stunner tho! That is an awesome photo! Congrats! Congratulations! I’ve always loved that photo on the Ganges. I remember getting an email from Adobe with your pictures in it, had to be a couple years ago at this point. Think that’s how I originally found your site. Fantastic! So nice that you are getting credit for your wonderful photos. Wow! amazing photo you truly deserve to win the big prize. Congratulations! Wow, well done, that’s a fantastic accolade… but perhaps not surprising, I’ve been admiring your pics for a while now. Can we have a blog on how you will bspend the £2k?! Happy travels! Great photo! Congratulations on your win :) much deserved. Nat Geo next? A month long celebration??? Where are you. We miss you. That’s an amazing award. Congrats……. Well done on the win, awesome photographs! Congratulations! You deserve to win. It’s a great set. Absolutely stunning – Nice one dude! ý kiến lớn blog , gắn bó với nó! It does take work, especially when starting out. I put in 60 hour weeks for the first year. Now it’s down to 40 or so. But it’s not a ‘vacation’ by any means. Push social media hard — Facebook, Twitter and G+. Share others’ work and they’ll share yours. Don’t publish something just to make a date — if it isn’t the best you can do, sit on it and wait to get it right. It’s better to share nothing than something that you’re not proud of.